Experienced Sales Assistant Wanted: Apply Within! Do you have heaps of enthusiasm? Do you adore the wedding industry? Have you got what it takes to provide fantastic customer service in the most fast-paced of environments? If you can answer, “yes” to these questions, La Boutique needs YOU. An experienced Sales Assistant for a busy Exeter bridal boutique. Flexible on hours and days, and must be able to work during the school holidays. Retail experience is essential, although bridal experience is also desirable. The right candidate must be reliable, committed, and patient, and pride themselves on customer service. This is a commission only based position with good rates, and with a high sales conversion rate. Think you have what it takes? To apply please send your C.V, with covering letter, to La Boutique, Unit 17, Exeter Business Centre, 39 Marsh Green Road West, Exeter, EX2 8PN, or via email to info@weddingwishingwell.org.uk. Closing date 2nd April 2015. On 17th May there will be a 5 or 10km walk, jog, or run taking place in Regents Park, London. Just £22 to enter, The Superhero Run looks set to be a great event, filled with costumes and laughter, as well as fundraising – what better excuse to get your trainers on?! If you would like more information please send your name and address, plus the word SuperHero, to info@weddingwishingwell.org.uk. Equally fun is the Santa Run, which is taking place in Victoria Park, London, on Sunday 6th December. Again, it costs £22 to enter, with plenty of opportunities to fundraise for The Wedding Wishing Well Foundation. To enter, please send us an email containing your name and address, along with the word Santa, to info@weddingwishingwell.org.uk. Have you heard about any other running events happening this year? Let us know at info@weddingwishingwell.org.uk. According to meteorologists, we are now officially in spring – and have been since the beginning of the month. Summer, and the ‘Wedding Season’ is almost upon us. We’re positively excited! We’ve decided to start the month with a ‘spring’ in our step, and share some of the most recent fundraising efforts that are helping us to achieve our dreams. Firstly we’d like to say a huge, “thank you” to all involved with The Lincs Wedding Show last month. The team raised a fabulous £112.00 for The Wedding Wishing Well Foundation, and we’re looking forward to working with them on a more regular basis. Keep your eyes peeled! We’d also like to say a big ‘Tweety’ thanks to The Little Wedding Helper, who hosts the Bristol Tweet Ups. The meetings have raised a brilliant £115.55 for us so far, and we can’t wait to see everybody at this year’s Tweet Ups. Upcoming dates can be found on Facebook here. A huge thanks to Weddings by Claire, who raised a brilliant £205 at her recent wedding fair at The Big Sheep. Thank you for your continued support. A BIG thanks to twobirds bridesmaids, who raised £203.33 for The Wedding Wishing Well Foundation at their most recent sale – it was a fantastic event, raising a great deal for our cause, as well as providing some blushing brides with their ideal maids’ gowns. Thank you to Jo and Sarah, who hosted the launch of Win Your Hertfordshire Wedding. A massive £2,700 was raised on the night, which was a great success and a real testament to those involved. If you live in Hertfordshire and would like to win a wedding worth £10,000 be sure to click the link above! Last, but by no means least, we’d like to thank Titan Exeter, for matching a donation we received to replace our broken laptop. That machine is integral to the work we do, so we are hugely grateful for their support. This fantastic event will feature a silent auction and raffle, both with some amazing luxury prizes, as well as afternoon tea – what better way to spend an April afternoon? Proceeds will be donated to The Wedding Wishing Well Foundation, so pop down to this beautiful venue. Tickets cost £5 for adults, and just £3 for children. Featuring a sponsored head shave, courtesy of Pippa Hosgood, as well as a raffle and charity Meat Bingo, this event promises to be a great one! Donations will be made to The Wedding Wishing Well Foundation, both on the night and via sponsorship, and we are so, so grateful for all of the hard work being put into organising this. You can find out more here, and donate to Pippa’s head shaving challenge directly here. Louise Baker, one of our volunteers, will be attempting the Run or Dye event at Chatsworth House, Derbyshire in October this year, in aid of The Wedding Wishing Well Foundation. Self-confessed Slummy Mummy Louise very rarely runs for the bus, let alone 5K, so we’re looking forward to following her progress. A sponsor form will be available to monitor her progress shortly. As always, we look forward to hearing your fundraising stories, and hearing about your amazing efforts. Please contact info@weddingwishingwell.org.uk with your news and updates. This is just a quick note to let everybody know that our Wedding Outfit Amnesty, which is currently being run in collaboration with Johnsons Cleaners, will be coming to an end on 31st March 2015 – you have until this date to donate your wedding dresses, bridesmaid outfits, jewellery, shoes, accessories, and bridal party clothing. We are endlessly grateful for the support of Johnsons Cleaners, and for all of their hard work over the last two years. We have received so many beautiful donations, which couldn’t have been achieved without their dedication. If you would like to donate your wedding dress after the end of March, please do so by sending it directly to The Wedding Wishing Well Foundation’s head office: 39 Marsh Green Road West, Marsh Barton, Exeter, Devon, EX2 8PN. Please call your nearest branch of Johnsons prior to making your donation to ensure they can accept your items. Devon wedding venue, Holne Park House, is inviting brides and grooms past and present along with their friends and family to attend a tea party to raise money for charity. 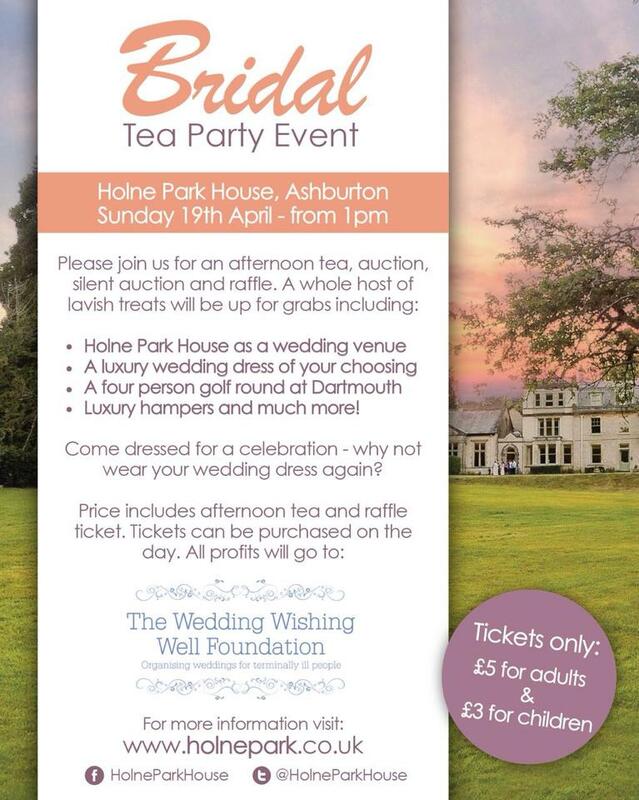 Holne Park House, based within the River Dart Country Park estate amongst 90-acres of stunning parkland, will open its doors at 1pm on Sunday 19th April to welcome guests for a classic afternoon tea ahead of an auction and raffle where a whole host of lavish prizes will be up for grabs. For brides and grooms to be, the silent auction boasts an incredible prize. Holne Park House is donating the venue free of charge for a wedding. Items included in the open auction includes a wedding dress of choice, wedding photography voucher, bridal accessories, sumptuous hampers, a caving trip, a tour of the Exeter Chiefs grounds, a golf day, plus many more. All proceeds from the auctions and raffle will go the Wedding Wishing Well Foundation, a charity which organises and funds weddings for terminally ill people. Tickets for the event will cost £5 for adults and £3 for children, which includes a scone with cream and jam, tea, coffee and squash plus a raffle ticket. Tickets can be purchased on the day. To add to the occasion, brides past are encouraged to relive their special day and wear their wedding dress again. All other guests are welcome to come dressed for a celebration. For more information, including regular updates of the event and a list of prizes to be won, please visit – www.holnepark.co.uk and www.facebook.com/holneparkhouse. And the winners are… Who won a coveted award at The Bristol and Somerset Wedding Awards? Friday 27th February saw one of the industry’s most prestigious events, The Bristol and Somerset Wedding Awards, take place at The Bristol Hotel, Bristol. Read on for a full list of the evening’s winners – we are so proud of you all! The evening’s festivities also included The Wedding Wishing Well Appreciation Awards, an opportunity for the charity to show its gratitude to those who have been so supportive of our work over the past twelve months. The awards is always an emotionally charged occasion, and we are so, so grateful for everybody’s help. Congratulations to the winners, and also to those who made the shortlist. We couldn’t carry on without your hard work and dedication. We can’t wait to start planning next year’s Bristol and Somerset Wedding Awards – keep your eyes peeled for the latest updates by following The Bristol and Somerset Wedding Awards on Facebook.